While well-heeled collectors can buy the original paintings (I witnessed a money bin painting sell at auction for over $250,000! 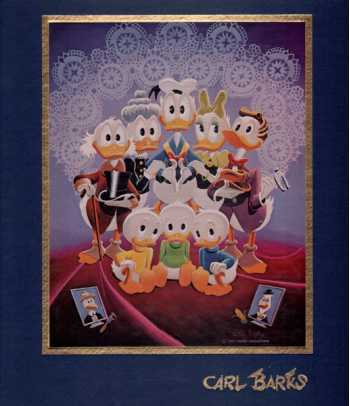 ), this book is the only repository for the vast majority of Barks' duck paintings. 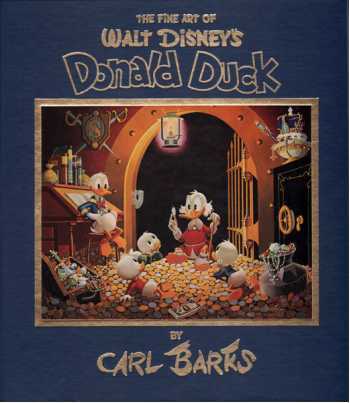 This massive volume includes all 122 of Barks’ 1971-1976 Disney oil paintings; reproduces 12 oils as giant 12”x 16” foldouts; annotates his paintings, examines his life, and studies his comic book work in 30,000 words of accompanying text; publishes a previously unpublished ten-page story (Donald Duck in "Silent Night"); and reproduces photographs of “the good duck artist” at home and at work. 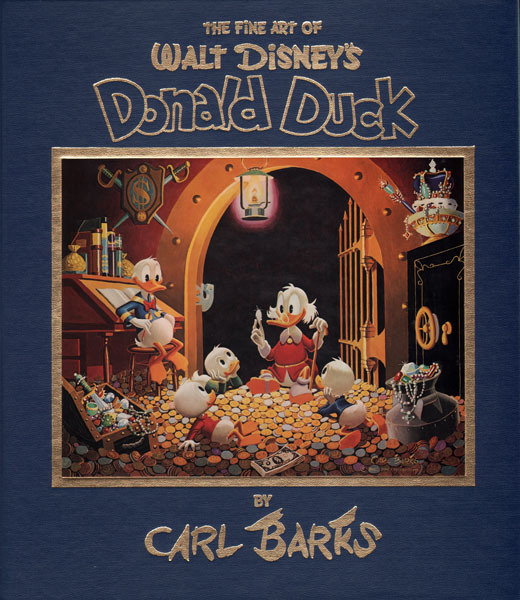 "This book of Carl Barks' paintings is the brainchild of two collectors who had been familiar with the Barks stories since childhood. 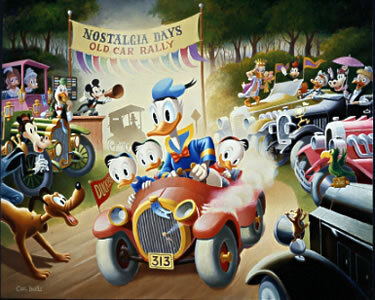 Both Russ Cochran and Bruce Hamilton had been Barks fans since the early 1940s when his stories started to appear in Walt Disney's Comics and Stories each month. "When the phenomenon of the Barks oil paintings started happening in the early 1970s, both Russ and Bruce were closely involved with not only the sale of the paintings to collectors, but also with suggesting concepts or ideas to Barks for future paintings. In the process, they became dose friends with Carl and Gare Barks and visited them in their home many times. 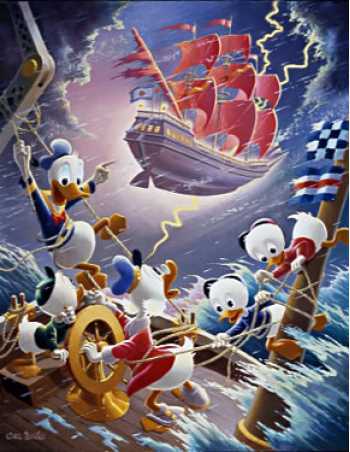 "The idea of publishing a book such as this, which contains all of Carl Barks' 122 Disney paintings, had been discussed at countless dinners and while driving around the country on collector-related business. When permission from Walt Disney Productions finally came for this edition, the thinking processes had been going on for so long the job was already half done. All that remained was to collect, from people Russ and Bruce knew all across the country, the professionally-made photographs from which the plates in this book were made. 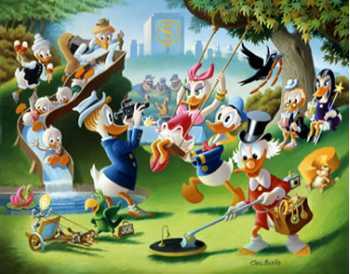 "Every effort was made to insure the best quality reproduction and most of the final cromalin proofs were approved by Carl Barks himself. The color separations were color-corrected and adjusted until everyone was fully satisfied with the results. No time or expense was spared. The foldouts were arranged to be fully-sewn and not merely tipped into the binding; the cover stock was chosen to last several lifetimes of use and appreciation. "Regardless of whatever future publication of Barks oils there might be, this special, limited and signed McDuck Edition will be the only complete and comprehensive assemblage of these very special paintings. It is an edition prepared especially for collectors by collectors. "The 122 paintings themselves, of course, are the ultimate in collectors items for the Barks enthusiast. This edition is expected to be the 'bible' for collectors who own (or seek to own) one or more of these paintings."